Remind your sweetheart again you have Love Locked her with your lifelong commitment with this little token of a charm! 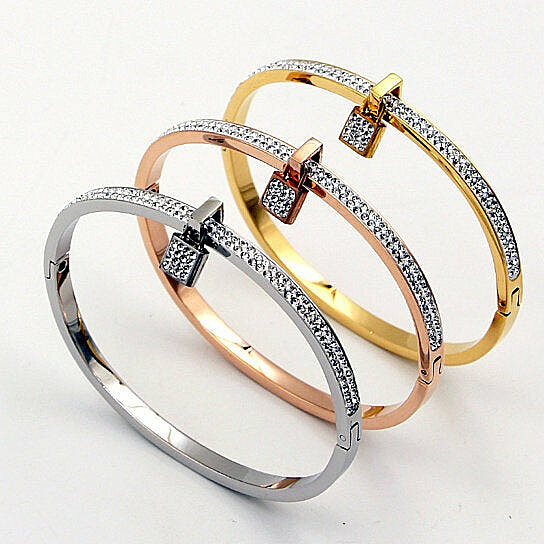 It is made in White Gold, Gold and Rosegold plating. It has delicate pave crystals that shine like real diamonds and the pave crystal little lock to express love and add to its charm. This open-ended bracelet measures 7 inches, opens to slip on and locks securely. The bracelets come in White Gold, Gold and Rosegold shades in a gift box for gift giving and safekeeping. Get more, each sold individually.